The Scottish Government has been warned it would be “intolerable” if it failed to make major improvements at a notorious north-east road junction. Liberal Democrat MSP Alison McInnes said a report on whether a flyover should be built over the A90 Aberdeen to Dundee Road at Laurencekirk cannot be allowed to “gather dust in Scottish ministers’ in-trays”. First Minister Nicola Sturgeon said last week that the study carried out on behalf of regional transport partnership Nestrans on future traffic growth in the area would be published this month. The announcement was made days after a man was pulled from his burning car after colliding with a lorry on the trunk road, where it meets the A937 Laurencekirk to Marykirk route on May 22. Mrs McInnes has written to Transport Minister Derek Mackay to urge the government to take responsibility for upgrading the junction after years of inaction. She has sought clarification on whether he and his colleagues maintain that it is the responsibility of any future housing developers to pay for a flyover. Mrs McInnes said: “It would be intolerable if yet another report detailing the dangers of the Laurencekirk junction was allowed to gather dust in Scottish ministers’ in-trays. Campaigner Jill Fotheringham said Nestrans had produced a document setting out options for the junction. She added that each proposal included plans for a flyover but she was in favour of option two because she believed improving the south junction to the town would have knock-on benefits for the area. 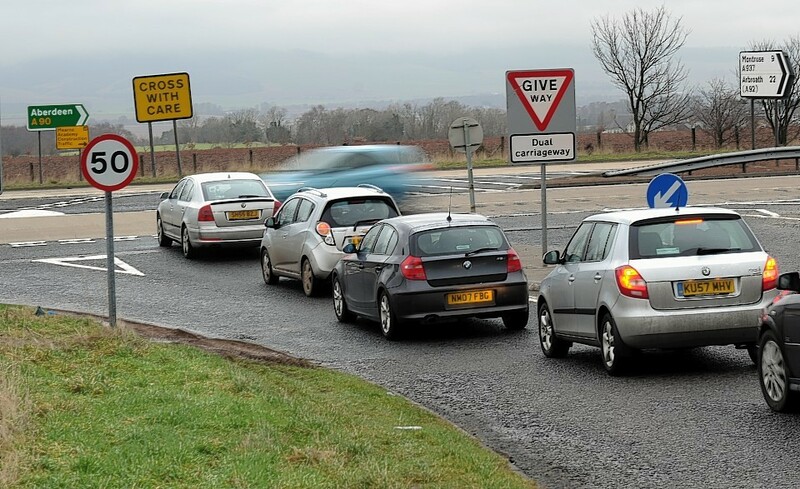 The proposal would provide safer A90 crossing opportunities, eliminate queuinn the A937 from both Montrose and Laurencekirk and lift the 50mph speed restriction. It would allow development in Laurencekirk with approved planning consent to proceed and safely accommodate increased traffic levels at the south junction. The document said that option two was the “lowest cost of grade separated packages” but would not reduce the risk of accidents at north and centre junctions.